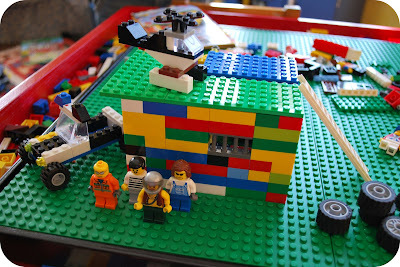 It's not often one gets to write "handmade" and "lego" and "drug cartel" in the same blog heading. Stick with me here and I'll explain. First off, I just wanted to share a few of the lovely handmade gifts my family participated in making this Christmas. Beeper made a couple of bookmark designs (above) which we then had printed at Overnight Prints for the ridiculously low price of $4.95 for 25 (I highly recommend this--the results were good, although the delivery of the goods took much longer than the website led us to believe it would). He then also designed his own mix CD of his favorite songs (also above), and created a cover for it (which I then scanned and printed copies of). 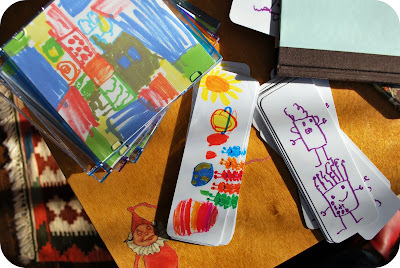 He gave the bookmarks to all of his kindergarten classmates, his afterschool program teachers and family and friends. The CD was a special gift just for his very best friends. And then Mr Beeper constructed this beautiful Lego table for Beeper. It is actually a tray that is backed with felt so it can sit on any surface and is easily moveable. I was impressed with the results of this (the man rocks my world). And this was when I realized that Beeper was a contractor for the Mexican Drug Cartel. I mean, look at them! Isn't it clear? Doesn't it all make sense? The safe? The bars on the windows? The escape ladder to the helicopter on the roof? Plus, look at that one in the orange jumpsuit--and the other still wearing his prison garb...shocking, I tell you. ::snort:: this was hilarious to read. thank you! bookmarking this post for gift ideas for next year. Swallowing balloons! I hadn't even thought about that. Oh my word, too funny!!! 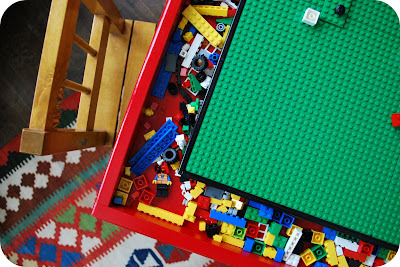 Your LEGO TABLE is the best! Can you explai how is made? We like to make one for our kids. Made by KK: I will need to confer with my husband on the construction of the table and how it all happened since I have not a clue. Perhaps we can put together a tutorial...will get back to you. this made me laugh out loud. fab! LOL - love the cartel - it's hilarious what kids come up with! 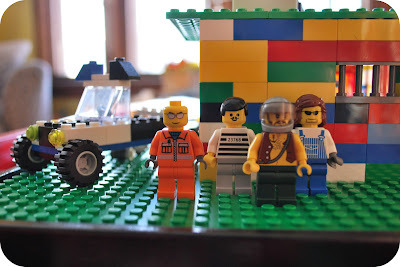 visiting from 733 blog, that lego story is hysterical! So, I'd LOVE to know more about how your hubby made this tray. It's by far the best lego tray I've seen! Thanks.